All of those descriptions seem perfectly apt for the hard-working, versatile star of 75 films who played roles ranging from the idealistic Father Flanagan in “Boys' Town” (1938) to a thinly-fictionalized stand-in for crusading lawyer Clarence Darrow in “Inherit the Wind' (1960). Earthy and dependable are not, however, the most likely ingredients for the creation of a romantic comedy lead. Nonetheless, the pairing of Tracy and Hepburn, often though not always in romantic comedies, became one of Hollywood's most reliable box-office pairings, and it all began with “Woman of the Year” (1942). Tracy and Hepburn portray journalists who work at the same newspaper (The New York Chronicle, a go-to fake newspaper name), but who inhabit completely different worlds. Sam Craig (Tracy) is a gruff, working-class sportswriter who sputters indignantly when he hears the sophisticated political reporter Tess Harding (Hepburn) poo-poohing the great American pastime of baseball as an inessential distraction during wartime. Tess might be described as the second-most important “dame” in America after Mrs. Roosevelt, but Sam intends to knock her down a peg or two. Dueling newspaper columns substitute for a more traditional meet-cute, soon forcing the odd couple into each other's arms. Their dance of seduction isn't exactly elegant. It's more like watching an aging, sleepy, slightly tipsy butcher awkwardly put his few limited moves on an undernourished grammar instructor, but audiences thrilled to the chemistry that also sparked an off-screen relationship and led to future pairings in blockbusters like “Adam's Rib” (1949), probably their most successful and popular film together. If Tess and Sam's insta-romance seems like a contrivance, the Oscar-winning screenplay by Ring Lardner Jr. and Michael Kanin quickly assures viewers that the unlikely couple will live happily never after, at least not before going through their mutual trials. Globe-trotting, politically-engaged Tess sees no reason to change her working habits just because she's changed her last name, and besides it's up to her to rescue Greek refugees and help scientists freshly escaped from the Nazis. This leaves Sam on his own to try to muscle his way into a very crowded world full of busybody personal secretaries, constant phone calls, and a steadily thrumming teletype. For you youngsters, the teletype is a device that brought information from the world into the home, and Tess is constantly staring at her toy, often ignoring people in the room with her, for fear of missing out on the latest news. But those were different times. 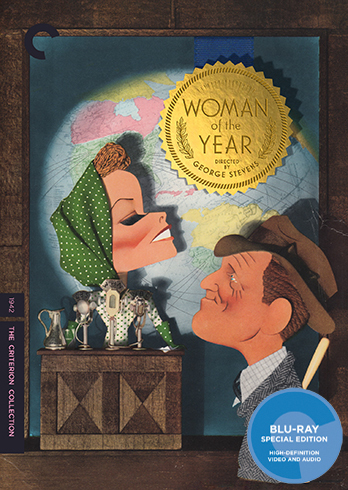 Director George Stevens, favored by Hepburn for this film because he was a “very male man”, is better known today for more serious fare like “A Place in the Sun” (1951), “Shane” (1953), and “Giant” (1956). However, Stevens's pre-war output crossed multiple genres from “boudoir” comedies to “Swing Time” (1936), easily one of the best Astaire-Rogers vehicles. The director disliked the term “screwball” as applied to romantic comedies of the time, or at least to his comedies, and there's nothing particularly screwball about his approach. Stevens prefers to center sequences on Tracy's static detachment and Hepburn's controlled, sometimes icy elegance, with little reliance on rapid-fire Hawksian dialogue or frenetic staging. Even the film's climactic sequence, Tess's extended failure to succeed at preparing a good meal for her new husband, is rather languidly paced, despite the occasional piece of projectile toast. Even most of the film's boosters admit that the ending, re-written after early test screenings sent the studio into a panic, is disappointing, if not outright disturbing. There was little doubt that Tess would have to change, but seeing the witty, courageous crusader tamed as the good housewife goes beyond the humbling Tess needs (as does Sam) into abject humiliation. It both provides an insight into gender perceptions of a very different era, and a reminder that some struggles are eternal, as Sam's “America First” attitude triumphs definitely over Tess's “globalist” agenda. The film is presented in its original 1.37:1 aspect ratio. There's the occasional tiny bit of damage visible in a few scenes, but this looks like it's been cleaned up quite well. The black-and-white contrast is strong throughout with a fine-grain structure that preserves that filmic look so well. Overall, it's a rich, pleasing image that should satisfy fans. The linear PCM mono audio mix isn't very dynamic, but it gets the job done. Dialogue is clearly mixed, and the score by Franz Waxman (which I have to admit I found a bit overbearing at times) is well-treated. Optional English subtitles support the English audio. Criterion has packed this disc with extras, though the heftier ones are older material. Let's start with the new extras. A short interview (6 min.) with the director's son, George Stevens Jr., is more of an appreciation than analysis. Biographer Marilyn Ann Moss, author of “Giant: George Stevens, A Life on Film”, describes Stevens as “the Walt Whitman of American film” in a new 14-minute interview, by which she means he had a knack for identifying and diagnosing the root problem in whatever slice of America he was examining. 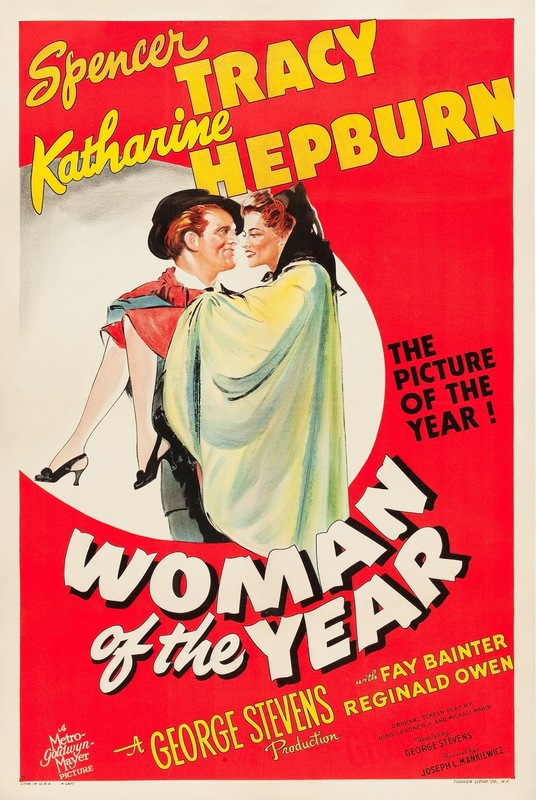 The piece touches on how much “Woman of the Year” was changed by test audiences, and particularly the women who disliked Tess for being so darn uppity. The other new feature is an interview (20 min.) with author Claudia Roth Pierpoint discussing the career of Katharine Hepburn. The disc also includes two feature-length documentaries, previously released on other DVD sets. “George Stevens: A Filmmaker's Journey” (111 min.) is directed by his son, George Jr., and features interviews with many of the director's colleagues (Frank Capra, John Huston) and cast members (Tracy, Cary Grant, etc.) It's fairly standard fare for a director documentary, but provides a comprehensive view of an expansive and sometimes overlooked career. “The Spencer Tracy Legacy” (86) min. is a 1986 documentary/tribute hosted and narrated by Katharine Hepburn, and does as good a job as possible of covering the bulk of Tracy's lengthy and busy career in under an hour and a half. It's even better than a baked potato, to be honest. The extras wrap up with an old Trailer (2 min.) which really plays up the Tracy/Hepburn pairing. The slim fold-out booklet includes an essay by critic Stephanie Zacharek. 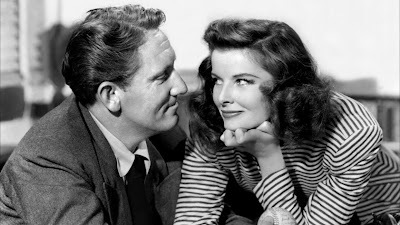 I'm still not sure I understand just why the Tracy/Hepburn pairing was seen as romantic comedy gold by audiences, but they are charismatic performers who make an uneven (though Oscar-winning) script work better than it should. This is where Tracy/Hepburn began, both on and off-screen, and Criterion has done a great job presenting the film in a lovely transfer and with a bountiful collection of extras.